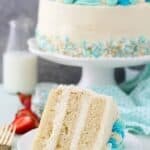 This Moist Vanilla Layer Cake is an easy oil-based vanilla cake recipe that is SUPER moist and spongy, you’ll know it’s a homemade vanilla cake. It’s decorated with the perfect vanilla frosting recipe. If you’re just stopping by here for the first time, I want to be sure that you know that there’s a couple different versions of this cake. Each recipe is prepared with the same ingredients but tailored specifically for either cakes or vanilla cupcakes. When I initially posted my Moist Vanilla Cake recipe, I got a lot of questions about baking it as a layer cake. 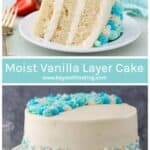 The quick answer is yes, but it’s a little more complicated for a layer cakes, so I thought it deserves its own specific post! The vanilla cake recipe is SO easy. It’s an oil-based cake recipe, so there’s no waiting around for the butter to soften or creaming the butter and sugar together. The oil also creates a more tender crumb in the cake. It’s gotten RAVE reviews. 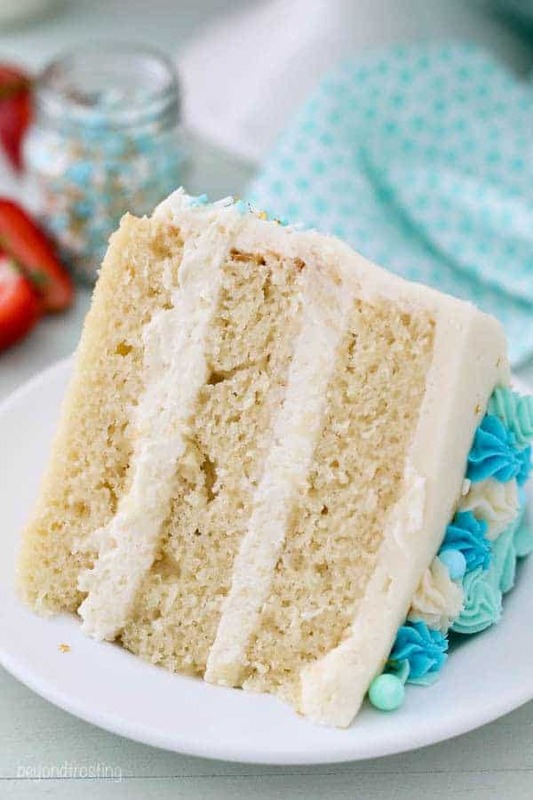 This cake recipe is denser than it is light and airy, but it’s super moist. The cake is very sturdy which makes it a great recipe for layer cakes. 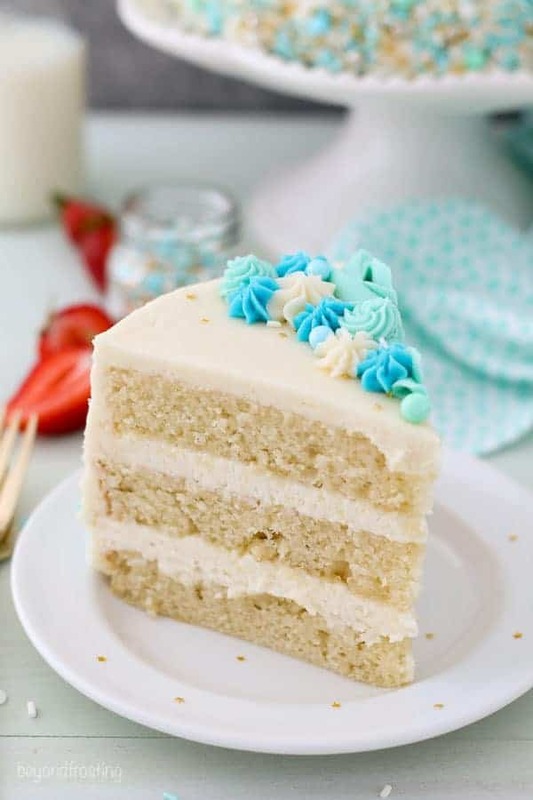 The vanilla cake can also easily be altered for different flavors as well. This recipe is the same one I used for my Strawberry Mascarpone Layer Cake and this Blueberry Lemon Mascarpone Cake. This recipe makes three 8-inch layers. My 8-inch baking pans are go-to size. I line all my pans with parchment paper circles or a Silpat liner. I also generously grease the sides of the pan with Crisco and a light dusting of flour. Finally, I use bake even stripes whenever I am baking round cakes. The bake even stripes help prevent the dome from forming on the top of the cake, because it prevents the edges from baking too quickly. As the edges of the cake bake, it pushes the batter towards the center, creating the dome. You need nice, flat top cakes when you’re making a layer cake. If your cake has a dome, use a large serrated knife or a cake level to cut the dome off the top. 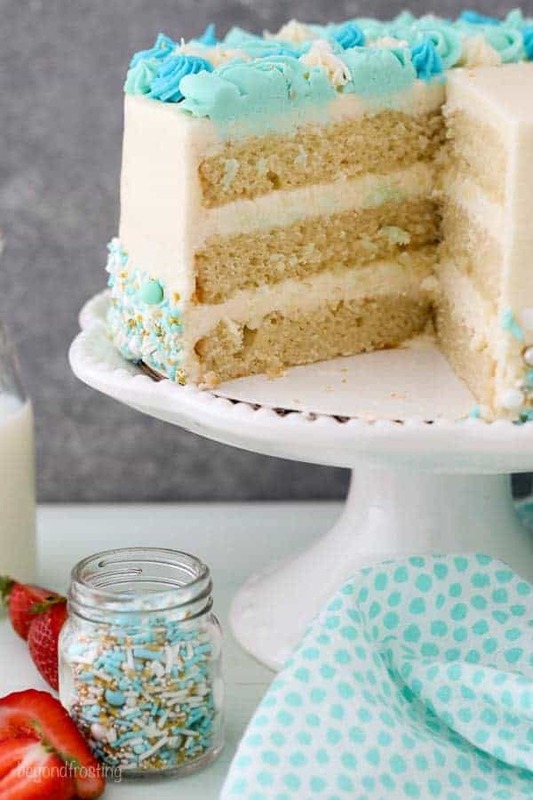 For this vanilla cake you’ll need quite a bit of frosting. Besides the filling in between the layers, you’ll need extra frosting for decorating. A batch of my perfect vanilla frosting should do the trick. If you don’t prefer the taste of American buttercream, you could certainly also make a large batch of Swiss Meringue Buttercream. The BEST part about that frosting recipe is that it starts with COLD butter. 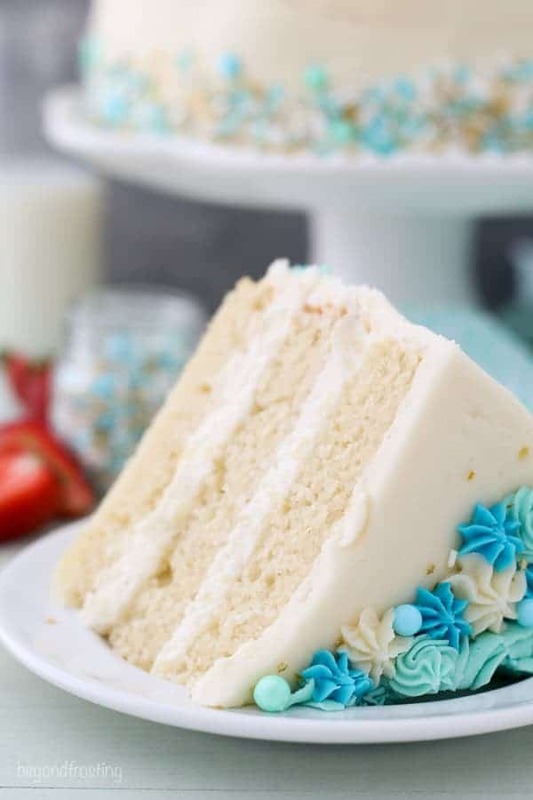 It helps the butter from getting too soft when decorating or when coloring the frosting. Plus, there’s no waiting around for your butter to soften. The one catch is that you have to beat the frosting for quite a bit of time, but this produces the best whipped, silky texture. You want to be sure the frosting is not too stiff, or it will be more difficult to actually frost the cake. If you think the frosting is too stiff, you can add additional heavy whipping cream (or milk), 1 tablespoon at a time, and beat for a few more minutes. Since this recipe requires so much butter, you might consider making only a half batch at a time if you’re using a standard 5-quart mixer. I have both a 5 and a 6-quart mixer, and I use my 6-quart mixer when I’m making this frosting. It’s a much larger capacity. Making buttercream and decorating cakes can be intimidating. I am right there with you! Thankfully, I have spent a lot of time writing about how to make buttercream frosting, so that you’ll be successful the first time around! 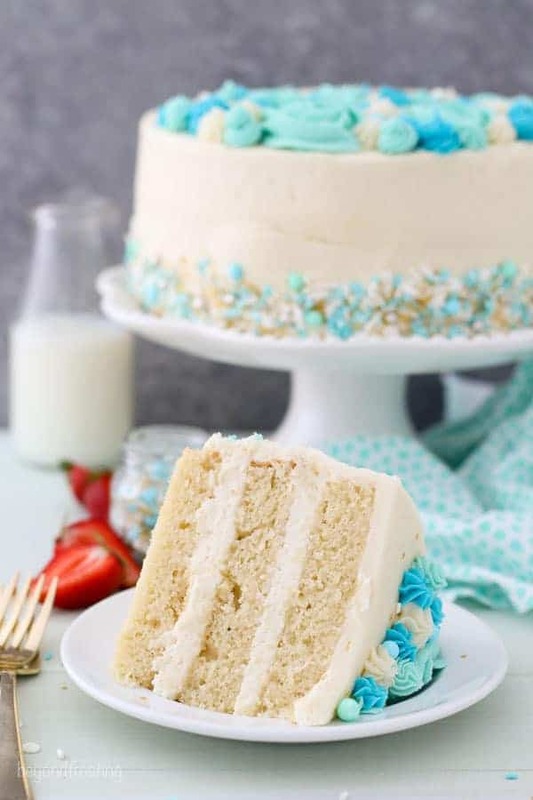 I love this Vanilla Layer Cake because I totally pushed myself out of my comfort zone in terms of decorating. I am NOT a cake decorator. However, after I took the Wilton Decorating course, it really helped me with the basics of how to decorate cupcakes and cakes. Of course, I’ve had a lot of practice over the years, but when it comes to cakes, I so often tend to stick with my go-to large open star tip. However, for this vanilla layer cake, I wanted to do something different! I know most cake decorators would probably cringe at my uneven distribution, I mean I didn’t intend to decorate half the cake, but I think it’s darn pretty anyway. This is a super approachable way to decorate a cake. I never thought I was very good at piping roses, but you guys, it’s SO SO easy! I just used a 1M piping tip. If you’re not fully comfortable, try piping a few of them on some clean parchment paper, and then you can reuse the frosting. The other piping tips I used for this cake were a size 18 tip and size 21 open star tip. If you use your piping bags with couplers, you can easily switch out the tips. These piping tips can be purchased at stores like Michael’s or a cake supply store, or online. All of the small flowers and rosettes were made using a combination of these tips. To color the frosting, you can use either the Wilton Color Right Food Gels or AmeriColor Gels. I think the AmeriColor gels because they offer a wide variety of colors and you can purchase them as single either online or at a cake supply store. The best way to dye your frosting if you’re looking for different shades is to start with a half a drop in one bowl and then get progressively darker. Just remember that you only need a TINY bit of this gel, to color these small amounts of frosting. It’s helpful to use a toothpick to add small amounts to your bowls at a time. Remember to save some of your white frosting to decorate with as well. 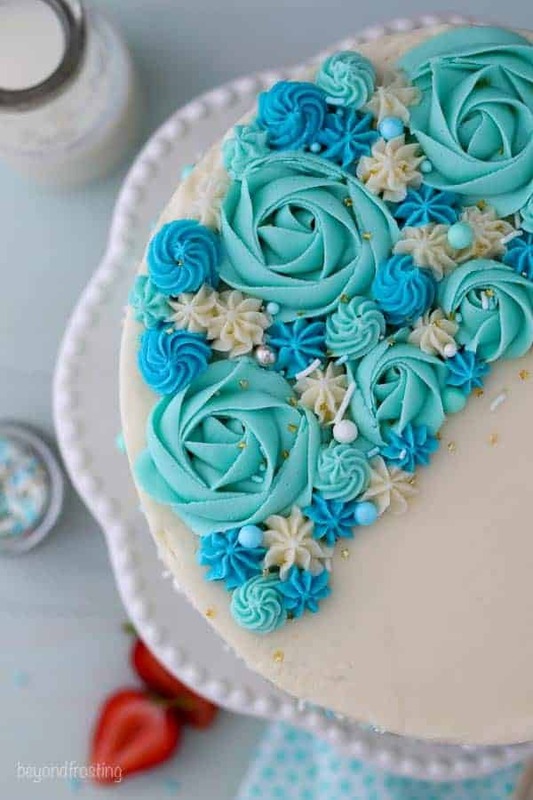 You need about 1 cup of frosting for the roses, ½ cup for the darker blue color and ¼ cup of the white frosting. Start by piping your roses, and then fill in the open spaces with the stars and rosettes. I don’t want you to be intimated by making layer cakes. There is much more time and patience involved, but I believe everyone can do it, especially if you have the right tools. I am always here to answer your questions as well! If you only have full fat sour cream that will work, your cake might just be a little more dense. Can I bake this in two 9-inch pans? Yes! For two 9-inch cakes, they baked from 28-32 minutes. Baking times will vary due to how full the pans are, type of pans and true oven temperature. Please note these did “crust” a little more on the outside edge due to extended baking times and they rose quite a bite in the middle, so you’ll lose more of the “dome” of the cake. For the cake: Preheat the oven to 350°F. Prepare 3 8-inch round baking pans, line the bottom with parchment paper and grease the sides. Prepare your bake even strips if desired. Combine the dry ingredients in a separate bowl. Add half the dry ingredients, beat on low speed while pouring in half of the milk. Mix just until the flour starts to incorporate. Finally add the remaining dry ingredients, mixing on low speed while pouring in the remaining milk and beating until all of the ingredients are well combined. Use a spatula to scrape down the sides of the bowl and stir the batter from the bottom to the top to ensure it’s well mixed. For the frosting: Cut butter into pieces. Using the paddle attachment, whip the butter for 5-7 minutes, scraping down the bowl occasionally. Beat until the butter looks light in color. Add 3 cups of powdered sugar and mix on low speed until incorporated into butter then add the vanilla extract and mix to combine. Beat for about 60 seconds. Add the last 2 cup powdered sugar along with 2 tablespoons of heavy whipping cream. Beat on low speed until ingredients start to mix together. Increase speed to medium-high and beat for another 3-5 minutes to whip additional air into the frosting. 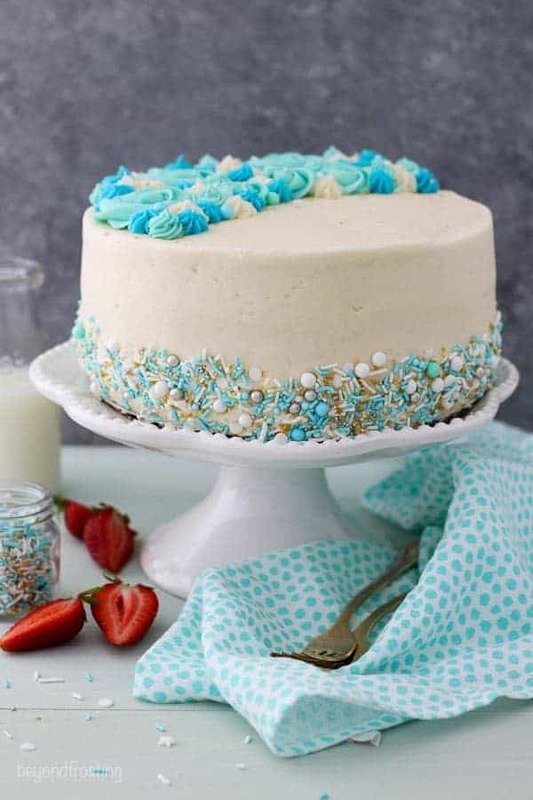 To decorate this cake: Use your hands to press the sprinkles into the sides of the cake. 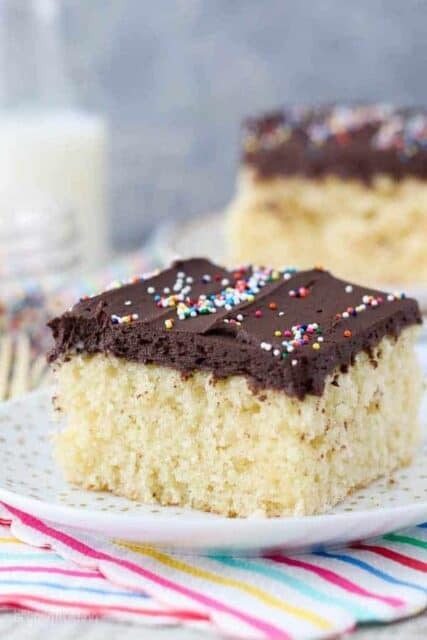 It’s best to do this over a sheet pan lined with parchment paper, allowing you to easily capture and reuse the sprinkles that fall off the cake. 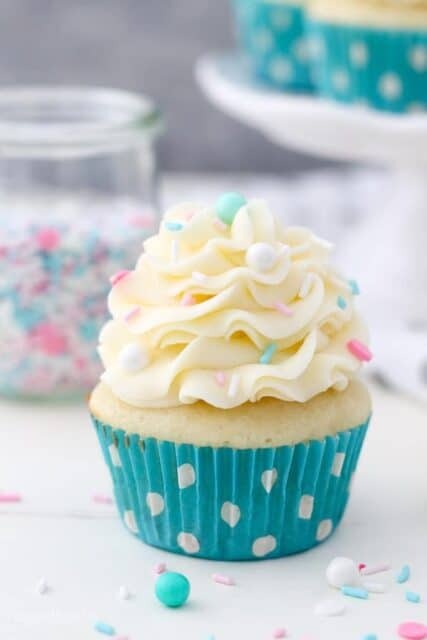 Take your leftover frosting and separate into 3 bowls: 1 cup, ½ cup and ¼ cup of white frosting (undyed). Dye the 2 bowls with you desired color. Remember you only need a touch of the gel color to dye your frosting. In a small piping bag, use a 1M piping tip to pipe the large roses on top of your cake. Place the other frosting in two small piping bags, fitted with a coupler and size 18 or size 21 tips, fill with your other color and the white frosting. Fill in the negative space with a mix of stars and small rosettes. Keep this cake covered in an airtight cake container. Serve within 3 days for best results. 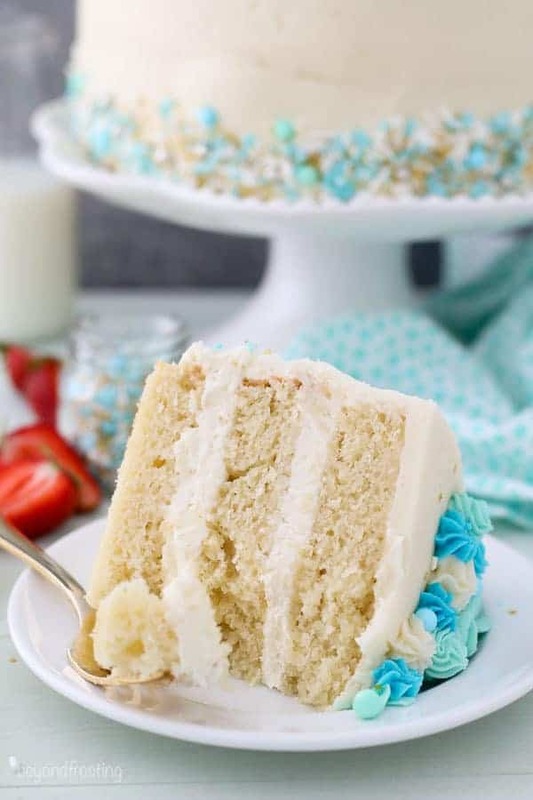 High humidity and warm climates might consider keep this cake in the refrigerator and allowing the cake to come to room temperature before serving. 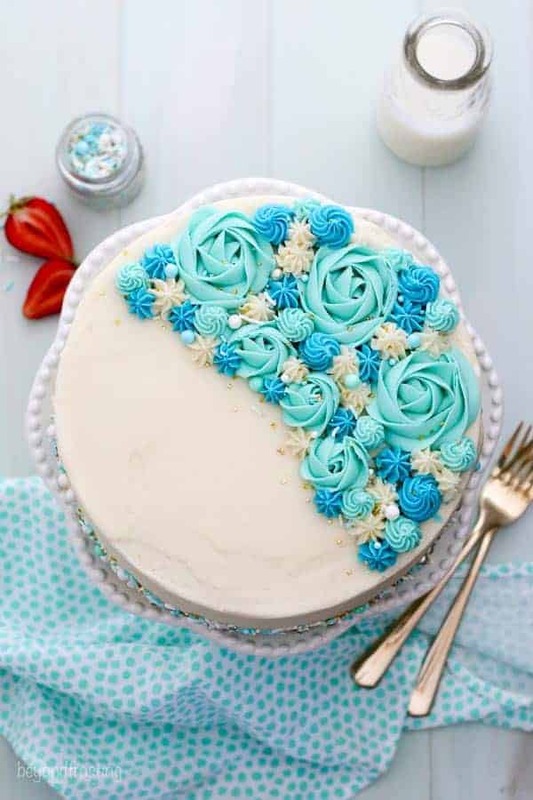 Depending on how much you fill the middle of your cake, you might need another half or quarter recipe of frosting to do your decorations, especially if you’d like to do more of a traditionally decorated cake with rosettes or something on top. I want to make this recipe using 2-10 inch pans for my daughter’s 1st birthday. Do you think that would work? Hi Raisa, yes that should work just fine. You will need to adjust the baking time accordingly and you’ll probably have leftover frosting. The cake was a good texture and nothing was really wrong with it. I thought it was a bit plain but maybe that’s just how vanilla cake is. I made two layers and have lots of frosting left over. Hi Nellie, thanks for sharing. Yes, if you’re only making a two layer cake, the frosting would need to be reduced. If you still have it, you can freeze it to use for a later time. I saw this recepi and decided to give it a try 🙂 I’m glad I did, moist,nice texture & flavor. ( I did soaked my cake a little bit w cake syrup) I always do 🙂 This recepi makes 6 full cups of batter. I used (3) 6″ round pan (2 cup of batter per pan) cooked for about 35 minutes. I wish I was able to share a picture of the cake I made using this recipe. It came out very nice! Awesome Laisa!! I am so glad you liked it! Thank you for sharing the additional details about the 6″ pan! This cake tastes amazing but i hard to double the amount of time it was in the oven for. 40 minutes it took in an 8″ round, in curious if you had a light or dark pan? 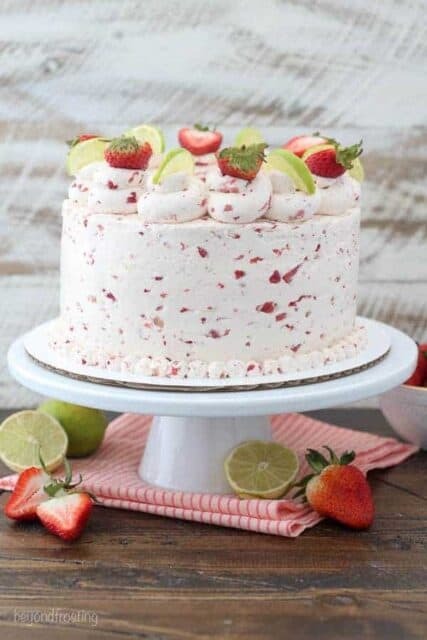 Can I make this cake with 2- 9 inch pans instead of 3- 8 inch? Hi Annie, I have not tried it myself. My only concerns is there is a lot of batter in this recipe, and that it might be too much for 2 9inch pans. Baking times will definitely need to be adjusted. However it’s on my list to test this out. Hi Annie- I tested this over the weekend. For two 9-inch cakes, they baked from 28-32 minutes. Baking times will vary due to how full the pans are, type of pans and true oven temperature. Please note these did “crust” a little more on the outside edge due to extended baking times and they rose quite a bite in the middle, so you’ll lose more of the “dome” of the cake. Enjoy! I rarely leave comments but I felt I had to for this cake! It was so delicious! It was light, moist and just had amazing texture and flavor! The only change I made was to add the zest of one orange and instead of 1 1/4 cups of milk I added 1 cup of milk and 1/4 of fresh squeezed orange juice…it lasted about one day in our house! Thanks for a great recipe! Wow Jill!!! That sounds AMAZING!! I love the idea and thank you so much for leaving me a comment, I love reading them. There are lots of recipes on here that start with a similar mix you might enjoy! 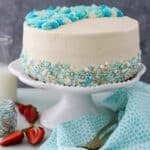 Can you use cake flour for this recipe or would that change the taste of the cake? I would like to try this recipe and I have a stock pile of regular sour cream. Would this alter the recipe in a negative way or would I be able to use it? Same question for the milk, I typically have whole milk, would I be able to use this? both should be fine. You cake might be a little more dense but it should still work. Hi, just found your site and am curious about your vanilla cakes. 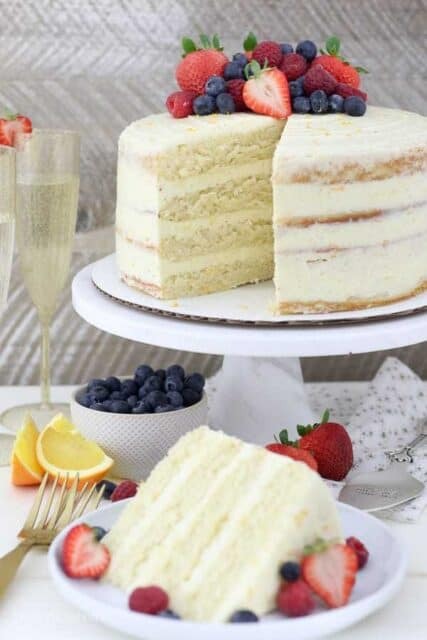 I have made countless vanilla/white cakes searching for the one I love most. I would like to try your recipe. My question is: I like tall cakes. My cakes average almost 5″ tall (I usually make 6″ layers, but sometimes 8″). Could you let me know about how tall your recipes/layer cakes end up? Thank you. Hi Paula, I can’t say off the top of my head by maybe 6-7 inches depending on how much filling you put in. I make 8 inch layer cakes, so they are not super tall.